Summary: Mote Marine Laboratory and Aquarium will complete Phase II of a major renovation and upgrade of Mote Aquarium’s sea turtle exhibit, Sea Turtles – Ancient Survivors. Phase II will complete the upgrade, converting remaining static displays to easy-to-use interactive displays that are both educational and entertaining. 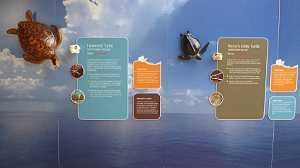 This includes additional models and graphics of Florida’s sea turtle species; displays on beach monitoring, conservation issues and nesting behavior; upgraded exhibit lighting; and a backdrop mural highlighting different habitats utilized throughout a sea turtle’s life. Results: Signage, models and skulls have been installed in the Hawksbill & Kemp’s Ridley Display. The mural was completed and installed. The collaborative effort and generous donation from the Sea Turtle Grants Program were highlighted in a press release regarding the installation of the mural. Signage has been completed and installed for the Conservation Wall Display and the pinball machine. Students at Ringling College of Arts and Design have been approached to create graphics for the machine backdrop. All new fixtures and lights have been installed for the Exhibit Lighting.